MSCTA indicates multislice computed tomographic angiography. The primary analysis was conducted on a per-graft basis according to the intention-to-treat principle. aSome patients had multiple reasons. ACS indicates acute coronary syndrome; SV, saphenous vein. P values were calculated by a generalized equation model. aSYNTAX scores are graded on a continuous scale in which higher scores indicate more complex coronary artery disease. Question Does ticagrelor + aspirin or ticagrelor alone compared with aspirin alone improve saphenous vein graft patency in patients undergoing coronary artery bypass grafting (CABG)? Findings In this randomized trial that included 500 patients with 1460 saphenous vein grafts, the saphenous vein graft patency rate 1 year after CABG was 88.7% in patients treated with ticagrelor + aspirin, 82.8% in patients treated with ticagrelor alone, and 76.5% in patients treated with aspirin alone. The difference between ticagrelor + aspirin and aspirin alone was statistically significant, whereas that between ticagrelor alone and aspirin alone was not statistically significant. Meaning Ticagrelor + aspirin improved saphenous vein graft patency 1 year after CABG vs aspirin alone; there was no significant improvement with ticagrelor alone vs aspirin alone. Importance The effect of ticagrelor with or without aspirin on saphenous vein graft patency in patients undergoing coronary artery bypass grafting (CABG) is unknown. Objective To compare the effect of ticagrelor + aspirin or ticagrelor alone vs aspirin alone on saphenous vein graft patency 1 year after CABG. Design, Setting, and Participants Randomized, multicenter, open-label, clinical trial among 6 tertiary hospitals in China. Eligible patients were aged 18 to 80 years with indications for elective CABG. Patients requiring urgent revascularization, concomitant cardiac surgery, dual antiplatelet or vitamin K antagonist therapy post-CABG, and who were at risk of serious bleeding were excluded. From July 2014 until November 2015, 1256 patients were identified and 500 were enrolled. Follow-up was completed in January 2017. Interventions Patients were randomized (1:1:1) to start ticagrelor (90 mg twice daily) + aspirin (100 mg once daily) (n = 168), ticagrelor (90 mg twice daily) (n = 166), or aspirin (100 mg once daily) (n = 166) within 24 hours post-CABG. Neither patients nor treating physicians were blinded to allocation. Main Outcomes and Measures Primary outcome was saphenous vein graft patency 1 year after CABG (FitzGibbon grade A) adjudicated independently by a committee blinded to allocation. Saphenous vein graft patency was assessed by multislice computed tomographic angiography or coronary angiography. Results Among 500 randomized patients (mean age, 63.6 years; women, 91 [18.2%]), 461 (92.2%) completed the trial. Saphenous vein graft patency rates 1 year post-CABG were 88.7% (432 of 487 vein grafts) with ticagrelor + aspirin; 82.8% (404 of 488 vein grafts) with ticagrelor alone; and 76.5% (371 of 485 vein grafts) with aspirin alone. The difference between ticagrelor + aspirin vs aspirin alone was statistically significant (12.2% [95% CI, 5.2% to 19.2%]; P < .001), whereas the difference between ticagrelor alone vs aspirin alone was not statistically significant (6.3% [95% CI, –1.1% to 13.7%]; P = .10). Five major bleeding episodes occurred during 1 year of follow-up (3 with ticagrelor + aspirin; 2 with ticagrelor alone). Conclusions and Relevance Among patients undergoing elective CABG with saphenous vein grafting, ticagrelor + aspirin significantly increased graft patency after 1 year vs aspirin alone; there was no significant difference between ticagrelor alone and aspirin alone. Further research with more patients is needed to assess comparative bleeding risks. Quiz Ref IDCoronary artery bypass grafting (CABG) remains the standard of coronary artery revascularization for patients with left main or complex multivessel disease, left ventricular dysfunction, and diabetes.1 Although arterial grafts are superior to saphenous vein grafts in terms of long-term survival and patency rates, up to 90% of patients in the United States and more than 95% of patients in China who undergo CABG receive saphenous vein grafts.2 Data reported from 1996 through 2003 showed that the rate of early saphenous vein graft failure was approximately 15% to 20% within 1 year after CABG and was associated with worse long-term outcomes and repeat revascularization.3 Platelet activation and thrombosis contribute to early saphenous vein graft stenosis.4 For this reason maintenance of saphenous vein graft patency is important. Quiz Ref IDAntiplatelet therapy with aspirin improves vein graft patency, reduces CABG mortality and major adverse cardiac event (MACE) rates, and is recommended after CABG in guidelines. Dual antiplatelet therapy (DAPT) with aspirin + a P2Y12 receptor antagonist (clopidogrel, prasugrel, or ticagrelor) enhances antiplatelet activity and improves outcomes in patients with acute coronary syndrome (ACS).5-7 However, the effect of DAPT in the setting of CABG has not been confirmed. Several small, short-term studies have provided conflicting results on the effects of DAPT on saphenous vein graft patency post-CABG.8-11 The inconsistency in previous trials’ data is due to small sample sizes, heterogeneous populations, and other limitations. Thus, a multicenter open-label clinical trial was conducted to compare the effect of ticagrelor + aspirin or ticagrelor alone with aspirin alone on saphenous vein graft patency 1 year after CABG. The Different Antiplatelet Therapy Strategy After Coronary Artery Bypass Graft Surgery (DACAB) trial was conducted in accordance with the principles of the Declaration of Helsinki12 and all applicable laws and regulations. The protocol and all amendments were reviewed and approved by the independent institutional review board responsible for each participating site (Supplement 1). Written informed consent was obtained from all patients. Quiz Ref IDPatients eligible for this randomized, multicenter, open-label trial were aged 18 to 80 years with indications for elective CABG surgery. 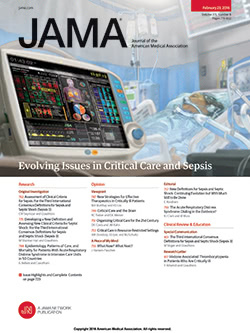 Major exclusion criteria included urgent revascularization or other concomitant cardiac surgery; a need for DAPT or vitamin K antagonist therapy post-CABG; and serious bleeding risk (eg, history of intracranial hemorrhage, bleeding diathesis within 3 months, or gastrointestinal bleeding within 1 year). The eAppendix 1 in Supplement 2 contains a comprehensive list of exclusion criteria. Eligible patients were randomized (in blocks of 3) sequentially 1:1:1 to start open-label antiplatelet therapy with 1 of 3 regimens within 24 hours post-CABG to continue for 1 year: (1) ticagrelor (90 mg twice daily; Brilinta, AstraZeneca) + aspirin (100 mg once daily; Bayaspirin, Bayer); (2) ticagrelor alone (90 mg twice daily); or (3) aspirin alone (100 mg once daily) (eFigure 1 in Supplement 2). The computerized randomization list was generated and maintained by Shanghai Bestudy Medical Technology, Shanghai, China. Investigators were blinded to the allocation process (sealed, opaque envelopes were used to conceal treatment allocation). The primary outcome was saphenous vein graft patency (FitzGibbon grade A) 1 year after CABG. Saphenous vein grafts were assessed by multislice computed tomographic angiography or coronary angiography and interpreted by an independent Image Data Review Centre blinded to treatment allocation (reports were anonymized to maintain blinding) using preplanned definitions (eAppendix 2 in Supplement 2). Secondary outcomes included saphenous vein graft patency 7 days post-CABG; time to first MACE (composite of cardiovascular death, nonfatal myocardial infarction, or nonfatal stroke), as defined by the American College of Cardiology and American Heart Association13 and judged by an independent Clinical Endpoint Committee blinded to treatment allocation (reports were anonymized to maintain blinding); freedom from angina after 1 year; and the incidence of atrial fibrillation within 7 days post-CABG. One-year and 7-day nonocclusion rates (FitzGibbon grades A and B) of saphenous vein grafts were also explored post hoc. Tolerability was assessed by bleeding incidence as defined elsewhere (eAppendix 3 in Supplement 2),14 adverse events, and serious adverse events. The trial was designed to compare saphenous vein graft patency 1 year post-CABG in patients randomized to ticagrelor + aspirin vs aspirin alone, and in patients randomized to ticagrelor alone vs aspirin alone. The sample size calculation was informed by a study in which the 1-year saphenous vein graft patency rate was 77.4% in patients undergoing CABG with open harvesting of saphenous vein grafts, 90% of whom were receiving aspirin.15 In addition, saphenous vein graft patency rates were 91.6% in patients receiving clopidogrel + aspirin and 85.7% in patients receiving aspirin alone 3 months after CABG in another study.9 On this basis, we assumed that the 1-year saphenous vein graft patency rate would be 90% with ticagrelor + aspirin, 87% with ticagrelor alone, and 80% with aspirin alone. Sample size calculations were performed with a 2-sided α level of .05 and 80% power. On the basis of these assumptions, 199 saphenous vein grafts would be required in each group for the comparison of ticagrelor + aspirin vs aspirin alone; and 441 grafts in each group for the comparison of ticagrelor alone with aspirin alone. A total of 500 patients would be required to provide a total of 1350 to 1500 saphenous vein grafts, assuming that each patient would receive an average of 2.7 to 3.0 saphenous vein grafts. The primary analysis was conducted on a per-graft basis according to the intention-to-treat (ITT) principle. The ITT population included all randomized patients. The modified full analysis set included all randomized patients who took at least 1 dose of study medication. Patients with missing multislice computed tomographic angiography or coronary angiography assessments were considered to have occluded saphenous vein grafts in the ITT analysis (saphenous vein grafts in such patients were imputed as treatment failures). The per-protocol population included patients who received the planned dose of study medication without interruption for more than 60 days or other major protocol violation, and had a primary outcome assessment. The per-protocol analysis was performed as a sensitivity analysis. A post hoc, per-patient analysis was performed in which patients were classified according to the graft with the greatest degree of stenosis. The generalized estimating equation model including terms for treatment was used to estimate between-group differences in saphenous vein graft patency and 95% CIs. The independent covariance structure was used to model the correlation of responses from the same patients. Unstructured and exchangeable covariance structures were used to check the stability of the model. The Hochberg method was used to control the overall α level at .05 (2-sided) for the comparisons of the primary end point. A post hoc mixed-effects model was performed for the 1-year patency and nonocclusion to explore possible heterogeneity across multiple sites and its potential effect on the stability of the primary results. The model included terms for treatment with site as a random effect and patients nested in site. The variance components were used for the covariance structure. Post hoc subgroup analyses were conducted with the generalized estimating equation models including terms for treatment, subgroup, and treatment × subgroup interaction to explore the consistency of treatment effect among key subgroups. Adjustments for multiple testing were not applied for secondary end points, which should be considered exploratory. A 2-sided level of significance of .05 was applied to general comparisons. All analyses were performed using SAS (SAS Institute), version 9.3. A Kaplan-Meier analysis of time to first MACE was planned; however, too few events occurred to make this practical. So a post hoc descriptive analysis was provided. A total of 1256 patients were screened for inclusion. Of these, 500 patients were randomized to treatment, received at least 1 dose of study medication, and comprised the ITT population (ticagrelor + aspirin, 168; ticagrelor alone, 166; aspirin alone, 166) (Figure 1). A total of 1460 saphenous vein grafts were implanted in patients treated with ticagrelor + aspirin (n = 487), ticagrelor alone (n = 488), and aspirin alone (n = 485). Patients were enrolled from July 2014 through November 2015 and follow-up was completed in January 2017. Baseline characteristics of patients and surgical procedure were well balanced across the 3 treatment groups (Table 1). Overall, 93.4% of patients (467/500) completed the primary end point assessment at 1 year after CABG, including 94.1% (158/168) in the ticagrelor + aspirin group, 94.0% (156/166) in the ticagrelor alone group, and 92.2% (153/166) in the aspirin alone group (Figure 1). Simultaneously, overall 93.8% (1369/1460) saphenous vein grafts were assessed at 1 year after CABG, including 94.9% (462/487) among patients treated with ticagrelor + aspirin, 94.3% (460/488) among patients treated with ticagrelor alone, and 92.2% (447/485) among patients treated with aspirin alone. Among patients treated with ticagrelor + aspirin, ticagrelor alone, and aspirin alone, a total of 5.1% (25/487), 5.7% (28/488), and 7.8% (38/485) saphenous vein grafts were imputed as treatment failures, respectively. Patient enrollment and assessments are presented by study site in eTable 1 in Supplement 2. The results of saphenous vein graft assessments are shown according to FitzGibbon grade in eTable 2 in Supplement 2. In the ITT analysis of saphenous vein graft patency, the primary outcome of 1-year patency rates (FitzGibbon grade A) were 88.7% (95% CI, 84.6% to 92.8%) among patients treated with ticagrelor + aspirin (432/487); 82.8% (95% CI, 78.0% to 87.6%) among patients treated with ticagrelor alone (404/488), and 76.5% (95% CI, 70.8% to 82.1%) among patients treated with aspirin alone (371/485) (Table 2). The difference in saphenous vein graft patency rate at 1 year for ticagrelor + aspirin vs aspirin alone was statistically significant (12.2% [95% CI, 5.2% to 19.2%]; P < .001), whereas the difference between ticagrelor alone vs aspirin alone was not statistically significant (6.3% [95% CI, –1.1% to 13.7%]; P = .10). The results of the per-protocol sensitivity analysis of 1-year saphenous vein graft patency rates were consistent with the ITT analysis (Table 2). A post hoc analysis showed that 1-year nonocclusion rates (FitzGibbon grades A and B) of saphenous vein grafts in 3 treatment groups were consistent with the primary outcome and were 89.9% (95% CI, 86.0% to 93.9%) for patients treated with ticagrelor + aspirin (438/487), 86.1% (95% CI, 81.6% to 90.6%) for ticagrelor alone (420/488), and 80.6% (95% CI, 75.3% to 86.0%) for aspirin alone (391/485) (Table 2). The difference in the saphenous vein graft nonocclusion rate at 1 year for ticagrelor + aspirin vs aspirin alone was 9.3% (95% CI, 2.7% to 16.0%; P = .006) and for ticagrelor alone vs aspirin alone was 5.4% (95% CI, –1.5% to 12.4%; P = .13). Between-group differences in a preplanned analysis of 7-day patency and a post hoc analysis of nonocclusion rates of saphenous vein grafts were not statistically significant (Table 2). The difference between ticagrelor + aspirin and aspirin alone groups at 7 days was 3.7% (95% CI, –0.9% to 8.3%; P = .11) for patency and 2.5% (95% CI, –1.9% to 6.8%; P = .26) for nonocclusion. Similarly, the difference between ticagrelor alone and aspirin alone groups at 7 days was 3.1% (95% CI, –1.3% to 7.6%; P = .17) for patency and 2.9% (95% CI, –1.2% to 7.0%; P = .16) for nonocclusion. A post hoc analysis showed that the between-group differences observed on a per-graft basis remained intact when done on a per-patient basis. The proportion of patients with patent saphenous vein grafts at 1 year was 82.0% (95% CI, 76.2% to 87.9%) for patients treated with ticagrelor + aspirin, 70.5% (95% CI, 63.5% to 77.4%) for ticagrelor alone, and 65.1% (95% CI, 57.8% to 72.3%) for aspirin alone (Table 2). The difference between ticagrelor + aspirin and aspirin alone was 16.9% (95% CI, 7.4% to 26.4%; P = <.001); the difference between ticagrelor alone and aspirin alone was 5.4% (95% CI, –4.7% to 15.5%; P = .29) (Table 2). The random effect of site was explored post hoc with a mixed-effects model. The results of treatment effect were consistent with the primary analysis (eTable 3 in Supplement 2). The results for the primary end point were generally consistent among different subgroups in a post hoc analysis (Figure 2). The results of this analysis suggested that ticagrelor + aspirin may be more effective than aspirin alone in patients with SYNTAX scores that are intermediate (score: 23-32; difference, 15.14% [95% CI, 5.78% to 24.50%]) or high (score: ≥33; difference, 17.64% [95% CI, 3.36% to 31.92%]) than in those with low scores (score: ≤22; difference, −6.17% [95% CI, −23.64% to 11.29%]; P value for interaction, .04). A total of 16 MACEs were observed during 1 year of follow-up post-CABG including 3 (1.8%) in the ticagrelor + aspirin group, 4 (2.4%) in the ticagrelor alone group, and 9 (5.4%) in the aspirin alone group (Table 3). The incidence of recurrent angina was similar in recipients of ticagrelor + aspirin (6.0%; 10/168), ticagrelor alone (6.6%; 11/166), and aspirin alone (7.2%; 12/166). There was no statistically significant difference (P = .21) in the incidence of atrial fibrillation occurring within 7 days post-CABG among recipients of ticagrelor + aspirin (11.9%; 20/168), ticagrelor alone (7.8%; 13/166), and aspirin alone (13.9%; 23/166). The incidence of major bleeding was low during 1 year of follow-up post-CABG. Overall, 5 patients experienced major bleeding, including 3 patients treated with ticagrelor + aspirin and 2 patients treated with ticagrelor alone (Table 3). Two of these individuals, 1 in the ticagrelor + aspirin group and 1 in the ticagrelor alone group, experienced CABG-related bleeding. No major bleeding resulted in either death or study medication discontinuation during the trial. Non–CABG-related bleeding was numerically more common in patients treated with ticagrelor + aspirin (30.4%; 51/168) than in patients treated with ticagrelor alone (12.1%; 20/166) or aspirin alone (9.0%; 15/166); however, the majority of these events were attributed to minimal bleeding (Table 3). The most common sites of non–CABG-related bleeding were skin, nose, and mouth. The total number of patients with serious adverse events was 15, including 3 in the ticagrelor + aspirin group, 3 in the ticagrelor alone group, and 9 in the aspirin alone group (Table 3). Quiz Ref IDIn this trial, ticagrelor + aspirin was superior to aspirin alone in maintaining saphenous vein graft patency for up to 1 year after elective CABG surgery in a general population that included a subgroup of patients with ACS and stable ischemic heart disease. The magnitude of the difference between ticagrelor + aspirin vs aspirin alone (12%) translates into a number needed to treat of 8 to prevent loss of patency of 1 saphenous vein graft over 1 year. Further study is needed to determine whether this significant benefit in graft patency translates into a meaningful improvement in clinical outcomes. The difference between ticagrelor alone and aspirin alone was not statistically significant. However, the point estimate favored ticagrelor by 6.3%, the 95% CI for the difference between ticagrelor alone vs aspirin alone was wide and included the point estimate for ticagrelor + aspirin, and the P value was .10; therefore, the study may have been underpowered to identify a beneficial effect of ticagrelor alone. A larger study will be required to answer this question. The results remained consistent when patients with missing end point data or reduced exposure to study medication were excluded in the preplanned sensitivity (per-protocol) analysis. In contrast to the significant differences observed after 1 year of follow-up, no statistically significant differences in saphenous vein graft patency were observed between the ticagrelor + aspirin group and the aspirin alone group at 7 days post-CABG surgery. In a post hoc analysis, the end point was broadened to include nonocclusion of saphenous vein grafts. The results were consistent with both the primary and sensitivity analyses. The results of the subgroup analysis raised the possibility that ticagrelor + aspirin may be more beneficial in protecting saphenous vein grafts in patients with severe coronary artery disease than aspirin alone. These results confirmed and extended the findings and conclusions of previous studies that have evaluated ticagrelor + aspirin combination therapy post-CABG.11,19 The results of a small randomized pilot study that enrolled patients similar to those in the present trial showed a reduction in graft occlusion rates with ticagrelor + aspirin combination therapy compared with aspirin alone. However, the study was small, had difficulty recruiting patients, and thus lacked statistical power to detect a significant difference. Moreover, graft status was evaluated at 3 months compared with 1 year post-CABG in the present trial. This study has several limitations. First, the trial was open-label, thus both investigators and patients were not blinded to treatment allocation. The open-label design is a weakness because patients may drop out if they perceive that they are receiving an inferior regimen. However, the patient retention rates were consistently high across 3 treatment groups. Second, the trial was designed specifically to examine saphenous vein graft patency; thus the results cannot be extrapolated to arterial grafts. Third, the trial lacked sufficient statistical power to identify a significant effect on the incidence of MACE or other secondary and bleeding end points. The low event rates in the present study could be used to inform the design of subsequent studies that evaluate the effect of DAPT on clinical event rates. Among patients undergoing elective CABG with saphenous vein grafting, the use of ticagrelor + aspirin compared with aspirin alone significantly increased graft patency after 1 year; there was no significant difference between ticagrelor alone and aspirin alone. Further research with more patients is needed to assess comparative bleeding risks. Corresponding Author: Qiang Zhao, MD, PhD, Department of Cardiovascular Surgery, Ruijin Hospital Shanghai Jiao Tong University School of Medicine, Shanghai 200025, China (zq11607@rjh.com.cn). Accepted for Publication: March 5, 2018. Author Contributions: Drs Zhao and Zhu had full access to all of the data in the study and take responsibility for the integrity of the data and the accuracy of the data analysis. Drs Zhao and Zhu are co-first authors of this article. Concept and design: Zhao, Zhu. Drafting of the manuscript: Zhao, Zhu. Conflict of Interest Disclosures: All authors have completed and submitted the ICMJE Form for Disclosure of Potential Conflicts of Interest. Dr Zhao reported receiving grant funding, personal fees, and nonfinancial support from Medtronic and Johnson & Johnson; grant funding from Novartis; and being an investigator on clinical trials sponsored by Novartis, Sanofi, and Bayer. Dr Zhu reported being an investigator on clinical trials sponsored by and receiving grant funding from Novartis, Sanofi, and Bayer. Dr Xu reported receiving personal fees and nonfinancial support from Medtronic. Dr Cheng reported receiving grant funding and personal fees from Medtronic. Dr Mei has served as a speaker for Medtronic. Dr Chen reported receiving grant funding and personal fees from Johnson & Johnson; grant funding from Bayer; and being an investigator on clinical trials sponsored by Bayer. Dr Wang reported receiving personal fees from Johnson & Johnson. Funding/Support: The study was funded by AstraZeneca. AstraZeneca provided the study medication free of charge. Role of the Funder/Sponsor: AstraZeneca had no role in the design and conduct of the study; collection, management, analysis, and interpretation of the data; preparation, review, or approval of the manuscript; and decision to submit the manuscript for publication. Previous Presentation: This study was presented as an oral presentation at the 2017 American Heart Association’s Scientific Sessions; November 11-15, 2017; Anaheim, California. Additional Contributions: We thank Blair Jarvis, MSc, ELS (Nucleus Global), for providing medical writing assistance funded by Ruijin Hospital, Shanghai, China. The independent Image Data Review Centre included Fuhua Yan, MD (Ruijin Hospital Shanghai Jiao Tong University School of Medicine), Jiang Lin, MD, and Hang Jing, MD (both from Zhongshan Hospital Fudan University). The independent Clinical Endpoint Committee included Dongmei Shi, MD, and Ran Dong, MD (both from Beijing Anzhen Hospital Capital Medical University), Song Xue, MD (Renji Hospital Shanghai Jiao Tong University School of Medicine), Ruiyan Zhang, MD (Ruijin Hospital Shanghai Jiao Tong University School of Medicine), and Lai Wei, MD (Zhongshan Hospital Fudan University). The statistical analysis was assisted by Shanghai Bestudy Medical Technology, Shanghai, China. All were compensated for their contributions.